Tokyo Tower (東京タワー Tōkyō tawā) is a tower in Shiba Park, Minato-ku, Tokyo, Japan (35°39′31″N, 139°44′44″E). It is 333 m (1093 ft) tall, making it one of the world's highest self-supporting steel towers and the tallest man-made structure in Japan. The design of the tower is based on the Eiffel Tower in Paris, France. Despite being 9 meters taller than the Eiffel Tower (33 if the latter's TV antenna is not included), Tokyo Tower only weighs about 4000 tons, whereas the Eiffel Tower weighs about 7300 tons. It is painted in white and international orange according to air safety regulations. From dusk to midnight, the tower is brilliantly illuminated in orange. The lighting is occasionally changed for special events; for the Japan premiere of the movie The Matrix, for instance, the Tower was lit in neon green. As it is mainly surrounded by low-rise buildings, Tokyo Tower can be seen from many points in the central wards of Tokyo, such as Roppongi Hills, Tokyo Bay, the east gardens of the Imperial Palace, and the southern promenade of Shinjuku Station. 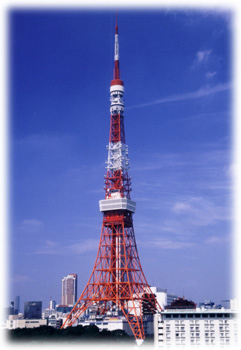 Tokyo Tower is a member of the World Federation of Great Towers. In the postwar boom of the 1950s, Japan was looking for a monument to symbolize its ascendancy as a global economic powerhouse. Looking to the Occident for inspiration, the Tokyo Government decided to erect its own Eiffel Tower. One of the tower's key early proponents was politician and Sankei Shimbun co-founder Hisakichi Maeda. The tower was completed by the Takenaka Corporation in 1958 (69 years after the Eiffel Tower) at a total cost of ¥2.8 billion. Maeda's son, Fukusaburo Maeda, later became president of Nihon Denpato, the tower's operating company. In 1988, at the height of the Japanese asset price bubble, he established a subsidiary (Tokyo Tower Development) to set up a golf course project in Chiba Prefecture. Although the golf course opened in 1995, it failed to make a return on its profits due to an economic recession in Japan, and the company ended up deeply in debt and losing money. 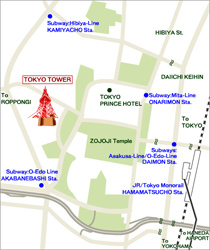 As a result Tokyo Tower was mortgaged for 10 billion yen in 2000. The planned opening of the taller Sumida Tower in 2011 is expected to further depress Tokyo Tower's profits as broadcasters move to the new tower. Although it chiefly functions as a radio and television broadcasting antenna support structure, the Tower is best known as a tourist destination, though it is decried by some as overpriced and inconveniently located, and as having poor amenities. The first floor houses an aquarium, home to 50,000 fish, the third floor is a wax museum and an attraction called the Mysterious Walking Zone, and the fourth floor a Trick Art Gallery. There are also two observatory floors, the main observatory (at 150 m) and the so-called "special observatory" (at 250 m); both afford a spectacular 360 degree view of Tokyo and, if the weather is clear, Mt. Fuji. Just as the Eiffel Tower is used in cinema to immediately locate the scene in Paris, perhaps even to the point of cliché, Tokyo Tower is often used in anime and manga. A common cliché is Tokyo tower being used as a setting for climactic events or battles; an example of this is the climactic they catch sight of it anywhere in Tokyo. In Sailor Moon, there is a Tokyo Tower in most episodes. In most CLAMP's works, the tower is frequently the setting for battles or magical power sources. An example of a drama that uses the Tower heavily as a device is Overtime. Tokyo Tower has in effect been destroyed in many anime series.